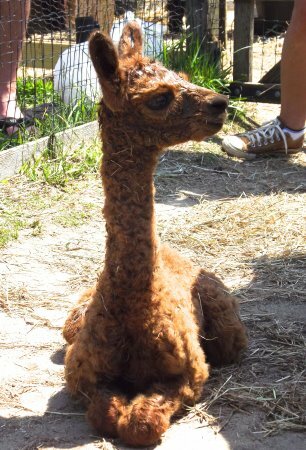 Island Alpaca was open to the public when the first cria ( alpaca baby ) was born. Island Alpaca "Snowmass Nova's Twilight" gave birth to a very handsome brown boy with loads of curls, at 10:37 am on Sunday, June 23 on a nice and sunny day. Early signs and stages of labor were noted by Island Alpaca Assistant Ashleigh Plante of West Tisbury, and stayed with her throughout the whole 30 minutes until the birth. Both Ashleigh and "Twilight" did a magnificent job, no surprise since this is her sixth baby, and Ashleigh's comfort and knowledge with the animals. He came into this world with one final push and he was a little slow to start, but within a short 20 minutes he was standing and nursing. A fast learner! "Twilight" was very patient with him as he got used to his long legs and searched hard for her milk. He has amazingly soft and dense fleece that has beautiful curls in it. We expect this new cria to be show-worthy in the future, and perhaps a herd sire down the line! He also has nice posture and straight legs and to top it off he has a mellow personality. His sire, Estrada has yet again assisted in creating this amazing cria! His weight was exactly 22lbs!! Quite a hefty size as normally they are 13-18 lbs at birth on average. 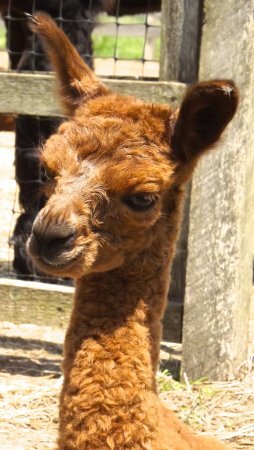 Island Alpaca invites everyone to come on down to the farm to meet the new herd-member. Adam Zimmerman (11 years old) who guessed 7 am on the same day, and Steven Norman of Edgartown, who guessed 5 am on the same day! This cria has been named "Titan"!